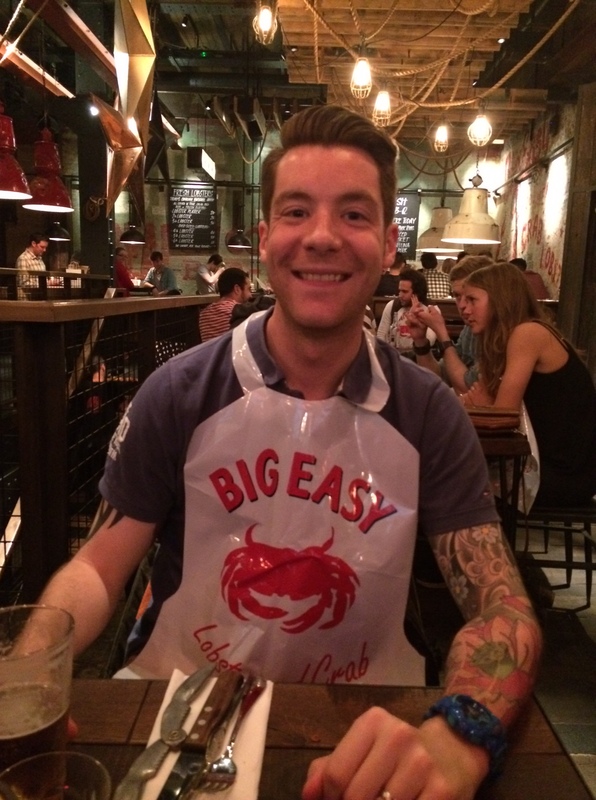 Saturday hubby and I decided to visit Big Easy Bar.B.Q & Crab Shack in Covent Garden. With our impending US trip in less than 3 weeks we decided we needed to acclimatise our palates to American Fare. 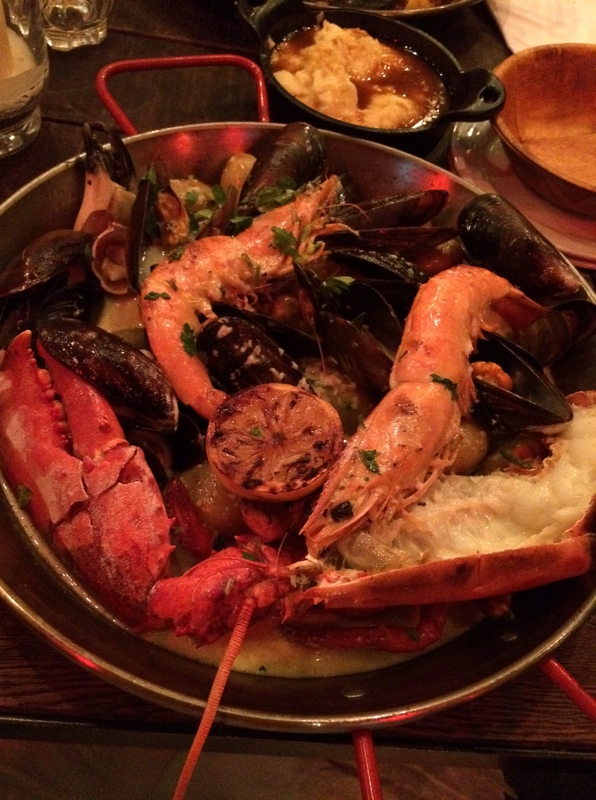 Plus we absolutely love BBQ, Seafood and American cuisine – this place had all 3. The décor inside was great, very well designed and very in keeping with the crab shack feel, nice touch were the neon lobster signs in cages hanging from the ceiling. Music was a rousing mix of bluegrass, jazzy Americana, not too loud but enough to get your toe tapping. I’d already spent a constructive afternoon before we booked looking at the menu to decide which cocktails to try, I’d whittled it down to 3 and started with the Margarita Slushie that consisted of Cabrito 100% agave white Tequila, St. Germain elderflower liqueur, Briottet orange liqueur, lime & white sugar. The tequila had quite a kick, but this was a nice refreshing start. Hubby started with a Big Easy Larger, which was actually Scottish even with the name Harviestoun Schiehallion. The prawns were good – juicy & tasty, a great way to start. For main we decided to go seafood, as we do BBQ meat a lot, but we love Crab & Lobster too, so we opted for the Lobster Bake consisting of Half 1½ lb Lobster, Peel ‘n’ Eat Jumbo Shrimp, Mussels, Crab Claws & New Potatoes cooked in Garlic Sauce, and hubby had Crabshack Combo consisting of Peel ‘n’ Eat Shrimp, Crab Claws, Mussels, Clams & New Potatoes cooked in Hot ‘n’ Spicy Sauce. We also ordered a side order of Mash & Gravy – just because! At this point I also ordered my second cocktail – Boozy Juice Calle 23 100% agave white Tequila with Watermelon juice, fresh-pressed at the bar. When the main dish turned up it was a little overwhelming and I was worried I wouldn’t even make a dent. I shouldn’t have been concerned! The Jumbo prawns were MASSIVE, the two in the dish would have been a meal in itself. Everything tasted great. The plastic bibs came in handy given the amount of claws we had to crack. This dish was very reminiscent of paella, but it had new potatoes and it may have been good to offer rice as an option. The potatoes were the only thing I left. We demolished the main course easily. Waiting staff were good at emptying the shell bowls, as we filled them to brimming! When it came to dessert the menu was a little limiting with not a lot of choice, but this was a perfect excuse for cocktail number 3. X-rated shake Grasshopper comprising of Mozart Dry chocolate spirit, Edmond Briottet mint liqueur, milk & chocolate ice cream. This was delicious but it pushed me offer the edge from being pleasantly full to stuffed and I couldn’t finish it. At just over £100 for a starter, 2 mains + a side, & 3 drinks each it wasn’t bad value. If I hadn’t had the cocktails it would have been super value, but not as fun! Definitely plan to go back as there were lots of other exciting dishes to try – I have my eye on the Taste-O-Rama! 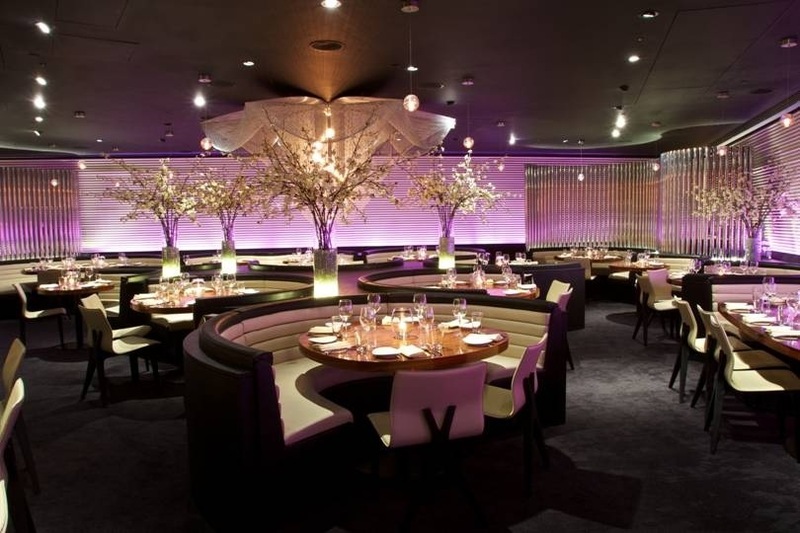 For our 2nd anniversary we decided to try STK at the ME hotel on The Strand. The hotel and restaurant are part of The One Group who are also the owners of The Cosmopolitan, where we stayed for our honeymoon in Vegas, so it was an apt choice to go for our meal. We reserved around 2 weeks in advance and could only get an early sitting of 6pm, with a 2 hour time limit for the table. The hotel is quite understated from the outside, so not easy to spot, but sits on the island between Aldwych and The Strand, so not too difficult really. 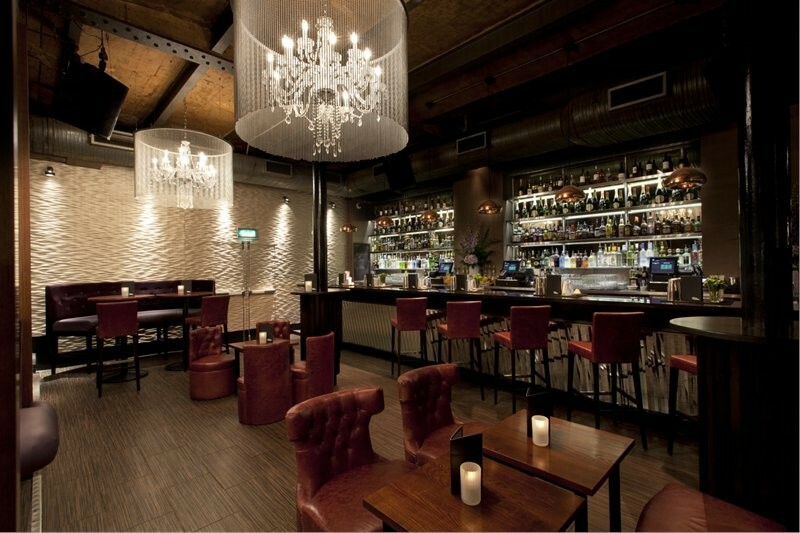 The restaurant is very stylish, with a dark and glitzy look. A nice selection of booths and tables, with ample space, so you don’t feel like your all squished in together. Our waiter was very attentive and took great pride in telling us how lively the place got later, with dancing on the tables when the DJ cranked up the volume. Seeing as we had to leave by 8pm this was a cunning ploy to pique our interest and maybe try for a later sitting next time. We ordered a Cocktail for me, Oh L’Amour, and Beer for Hubby. For food we chose the Chateaubriand to share, Lobster Mac & Cheese and Parmesan Truffle Chips. The main also came with Foie Gras and Spinach. The meat was cooked perfectly and there was plenty of it, so much we took home a doggy bag! The mac & cheese was delicious, and chips super tasty! With my steak I had a glass of white wine and hubby a glass of Malbec. Hubby had spotted a Cheese & Champagne restaurant earlier in Coventry Garden, so he already had dessert sorted, so I opted for the Cold Chocolate Fondant. It was amazing! 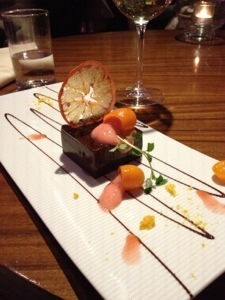 The base had popping candy in it, and the orange sauce was lovely. At every course the waiter had some interesting fact to share about what we were eating or drinking, and was a great host for the evening, always ensuring we had enough water etc. The atmosphere was relaxed and comfortable. Food was perfect, and not too unreasonable for central London. We have seen how lively The Cosmopolitan got as the evening drew on, so can only imagine what STK London could be like after dark. Only negatives would be the distance to the toilets – around 4 flights downstairs. And the fact that the service charge doesn’t go just to your waiter/waitress, but to the restaurant. This isn’t a big surprise, it was more the fact that they point this out on the bill, which almost guilts you into adding extra to the 12.5% already on your bill. 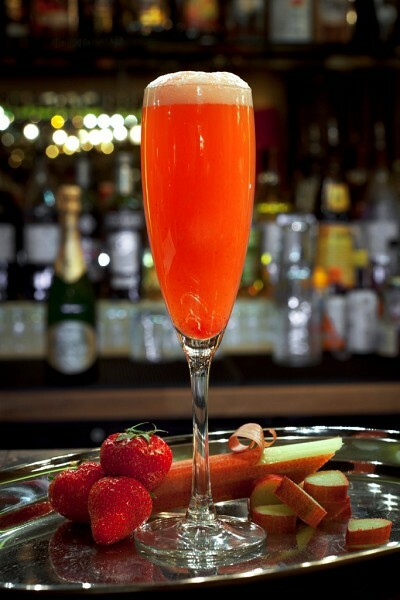 We would definitely go back to try some of the other items on the menu, especially their great choice of cocktails.